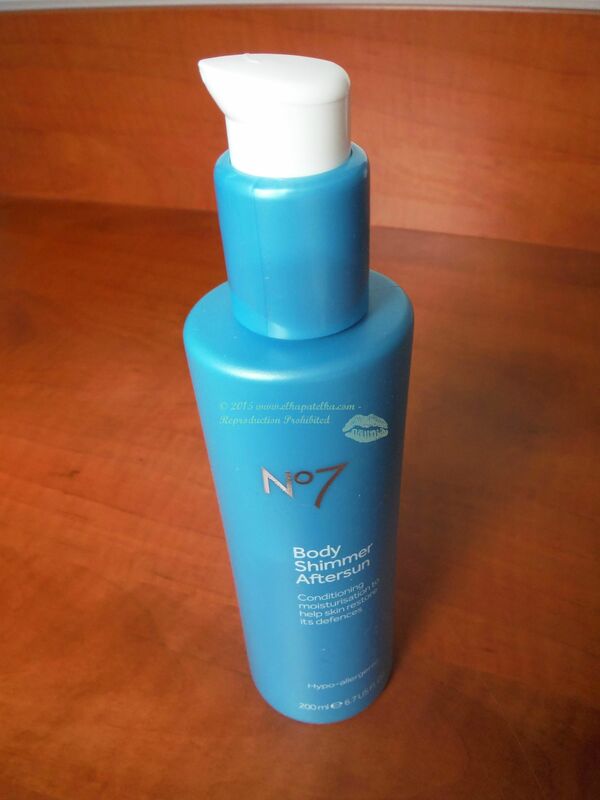 No7 Body Shimmer Aftersun has a definitely fresh scent of Aloe Vera. It has an elegant dark golden colour and a good, liquid consistence. Package is a strong plastic bottle, easy to hold in hand and pump is a very higenic solution for a holidays. Product will last longer if the dirt and air does not go inside while application. I am not a fan of getting brown skin as I am aware of the skin cancer risk, but on my lightly tanned skin this product looked really good, especially in the evening. It does snot look like a cheap glitter-rather subtle and elegant. 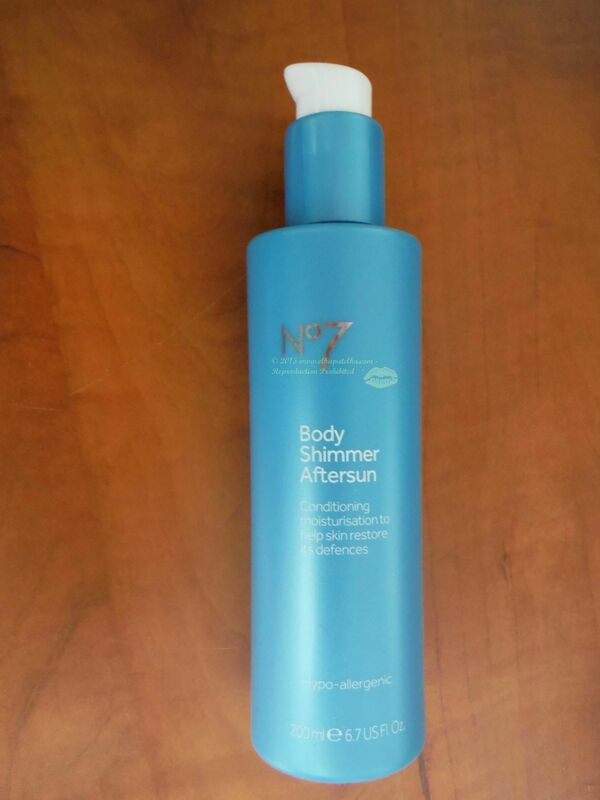 Your arms, legs or decollete will look amazing with the finish of No7 Shimmering Aftersun lotion. I have selected it as it is hypo-allergenic. It did not cause any skin irritation. It calmed a little bit my skin, counteracting the drying effects of the sun-this is what you need after the sun bath. This aftersin works well with other No7 sun protection products-I blogged about some of them already here, as all of them are hypo-allergenic-important for all ladies with a hyper sensitive skin. You can find on my blog the sun face moisturizer from No7, a review from last summer-an excellent product as well, which I continued to use after my holidays, during all the sunny days in London-surprisingly we have a bit of sun here since the global warming is getting worse and worse. I tried to get the ingredient list for you, but I could not find any information about it on Boots website-a little bit scary, isn’t it? However, the best would be to avoid the sun damage and stay in the shadow between 10-15 when sun is the strongest, my dear! This entry was posted in Boots, No7, Sun care products and tagged aftersun for a sensitve skin, balsam po opalaniu do skory wrazliwej, Boots, hypoallergic after sun lotion, No7, shimmering body lotion.